Storms and floods set to worsen conditions, as malnutrition, diarrhoea and malaria plague 100,000 refugees fleeing conflict in Blue Nile region. After decades of ethnic and political violence between northern and southern Sudan, the 2011 separation of the region into two countries was meant to herald a few first tentative steps on the road to peaceful developmental stability. 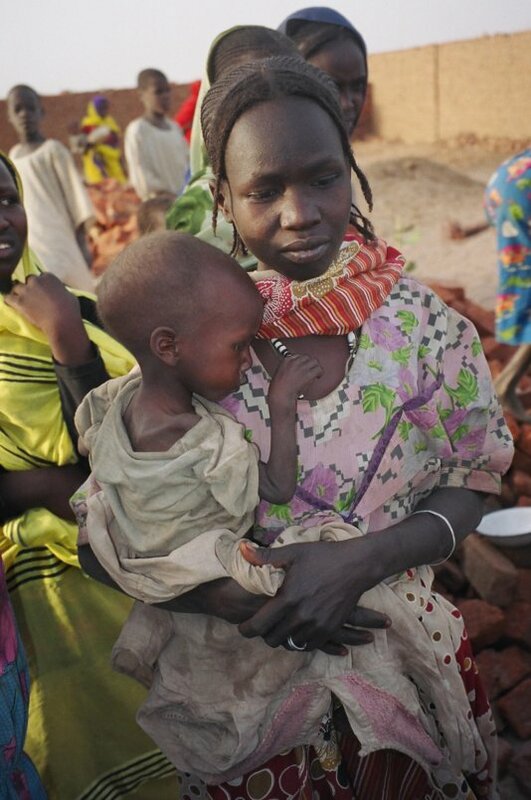 However, over 170,000 North Sudanese refugees have recently flooded into camps just over the border of the two countries, as they flee the deadly, escalating conflicts that continue to rage in the Blue Nile border region, and which threaten to initiate an absolute humanitarian disaster. Sara Hjalmarson, Médecins sans Frontières' emergency coordinator at the Batil refugee camp, has told the BBC that among the camp's ever increasing population of 35,000 refugees, three or four children under the age of five die every day as a result of malnutrition, dehydration, and an ensuing vulnerability to disease. Before they reach the camps, many of these refugees have already died of exhaustion along a desperate journey away from the disruptions of conflict; a starkly diminished food supply, an absence of services such as medical care, the murder of civilians, and routine sexual crimes against women. As Hjalmarson continued, after a journey that often involves six weeks travelling on foot and eating little more than leaves, those who do make it to the camps are greeted with a situation that is "far below what it should be" in regard to the "provision of proper water, sanitation and appropriate food". Médecins sans Frontières are stepping up their activities in the region, and calling on the international community to do likewise. However, the Batil camp sits on a floodplain, in an area particularly difficult to reach as a result of a wet and muddy terrain that is almost impassible by land. Additionally, worsening weather threatens to exacerbate the situation and kills thousands more, as the camps sit within the meteorological phenomenon known as the Intertropical Convergence Zone, which will continue to bring violent storms and heavy rainfall to the area over the coming months. The resultant flooding has already turned one camp into an effective island, and has the potential not only to limit accessibility, but to flood the camps themselves. Another MSF aid worker commented: "Clearly, the current amount of aid is inadequate to cope with such high needs. In order to prevent the health of children, pregnant and lactating women from worsening rapidly, they need a rich and varied diet that contains protein and micronutrients. We are undertaking a nutritional and mortality survey right now, in order to better understand the needs and adapt our response. We are very worried about this situation. We have to be ready for the worst. What we are facing is an extremely serious situation."